As LB Reggie Ragland denied the Aggies a chance to get points on the board with his terrific interception, Bryant Denny Stadium erupted with its loudest cheer of the day. It was a good symbol of how the team felt following the last two ugly, road games. Bama was glad to actually play football. Coach Nick Saban summarized the teams emotions this season with the story of Secretariat. 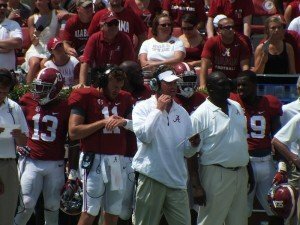 While the owners of the horse worried about how to race, the situation applied to the Alabama football team when Saban stated “Let the Horse Run”. TJ Yeldon rushed 13 carries for 114 yards and 2 touchdowns, while Amari Cooper had 8 receptions for 140 yards and 2 touchdowns. The Aggies defense was clearly winded trying to keep up with these two, which may account for the large blowout. Kevin Sumlin and the Aggies have a lot of work to do in order to stay relevant in the SEC considering how well Ole Miss and Mississippi State are playing now.